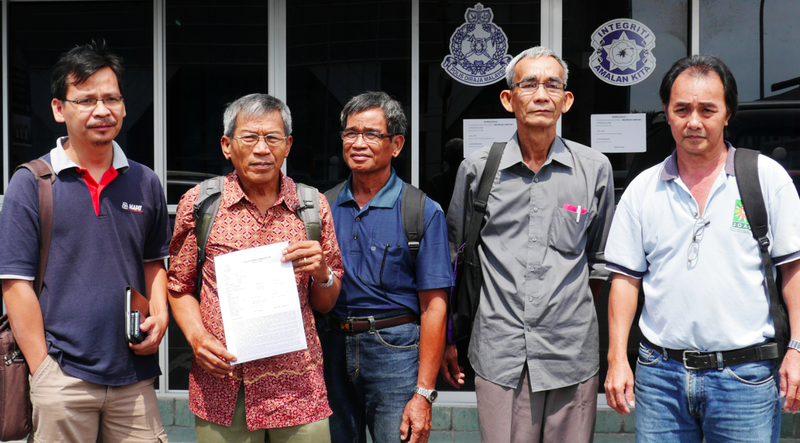 Miri – Land owners from Long Keseh and Na’ah submitted an official complaint to the Malaysian Anti-Corruption Commission (MACC) and made a police report on the illegal logging activities which are carried out on the access road and site of the proposed Baram dam. The basis of their claim is that the documents for the timber licence shows that it was one of the preparatory works for the proposed Baram dam. All the affected lands are Native Customary Right lands within the boundaries of the two villages. The complaints were made against the logging companies M.M. Golden Sdn. Bhd./or Autorich Sd. Bhd., the Forestry Department, Sarawak’s Ministry of Resource Planning and Environment and Sarawak’s Ministry of Natural Resources. Philip Jau, the Chairman of the Baram Protection Action Committee commented, “Logging as done by the said company and the construction of access road to the proposed dam site is a prescribe activity for which an Environmental Impact Assessment Study (EIA) must be carried out. Once done, the EIA should be displayed for public comments or in-put. Only after that can it be endorsed by the Natural Resources and Environment Board (NREB). That requirement has been left out and this is just one of their failures here,” he said. The Police Report was made at the Central Police Station in Miri at 2.00 pm on the 1st of August 2014 while the report to the Malaysian Anti-Corruption Commission was made in at the MACC office in Miri at 3.30 pm on the same day.